This amazing trip will bring us to 2 countries the controversial Holy Land for the major religions of the world, Israel. 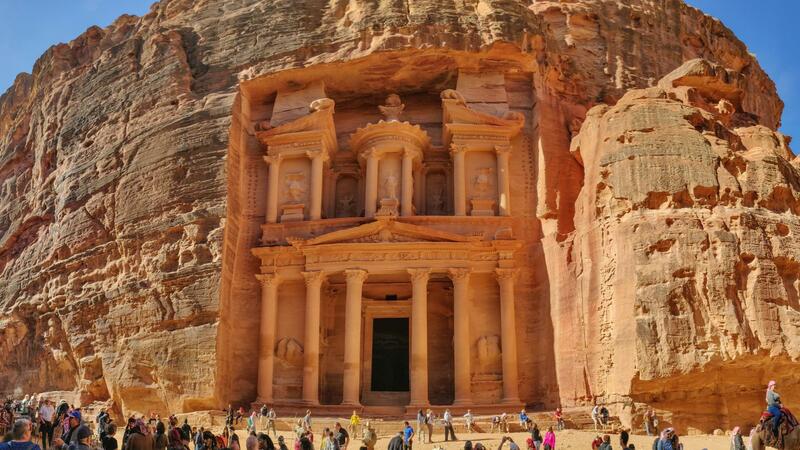 The other to Jordan, made famous by 1989 movie "Indiana Jones and the Last Crusade" film directed by Steven Spielberg. 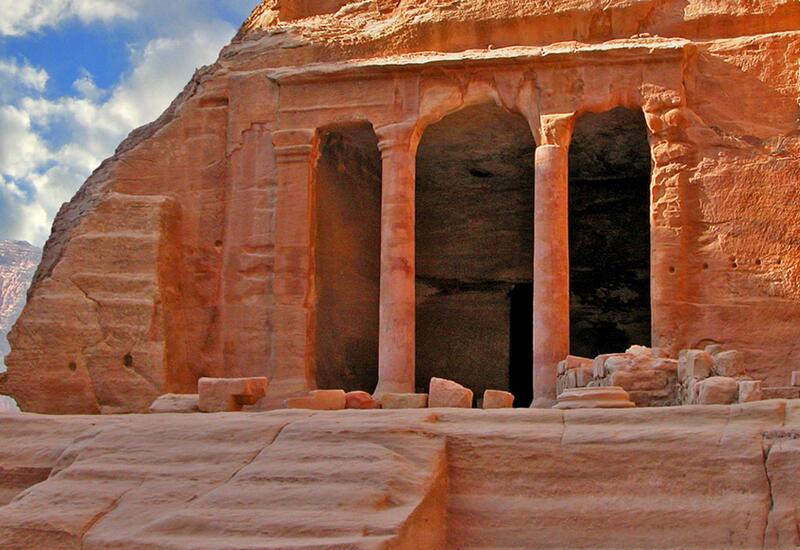 We will be going to Petra widely referred to as "That Place from Indiana Jones". In Israel with an Israeli archaeologist who will be helping us to understand and appreciate why Israel is what is it today, and even going to the places in the West Bank, Hebron and Bethlehem. Let's begin our ancient journey. We will begin our amazing trip in Jordan Jerash, one of the great Roman cities of the Middle East. 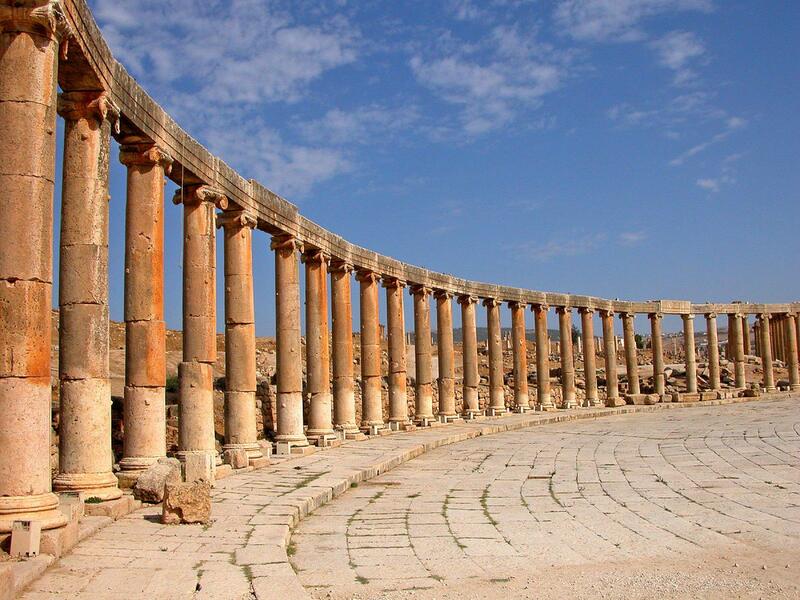 Jaresh founded at the time of Alexander the Great, Jerash flourished for around a thousand years as a trade center on the road between Damascus and Petra. The city's colonnaded streets are basically intact, as is the beautiful oval forum and the gateway built to commemorate the visit of the Emperor Hadrian. The theatre, temples, baths, and hippodrome are all well preserved, and there are some wonderful Byzantine mosaic floors from the early Christian period. 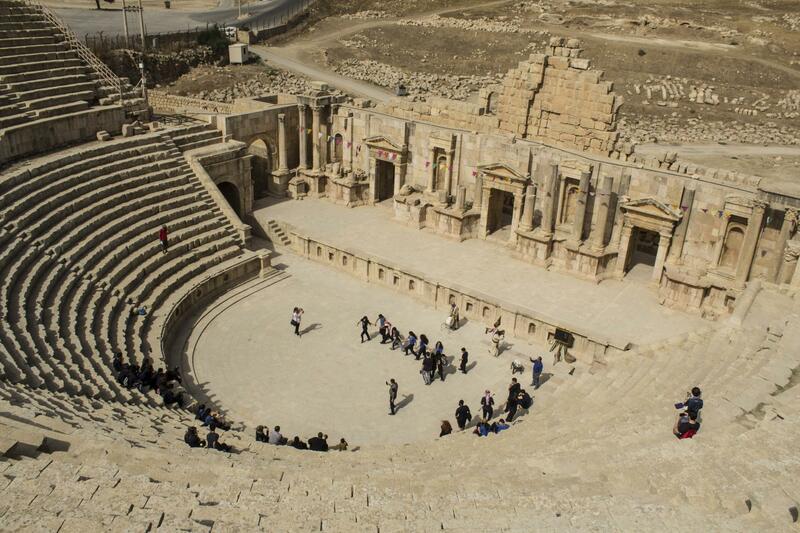 We will move on to explore Amman. 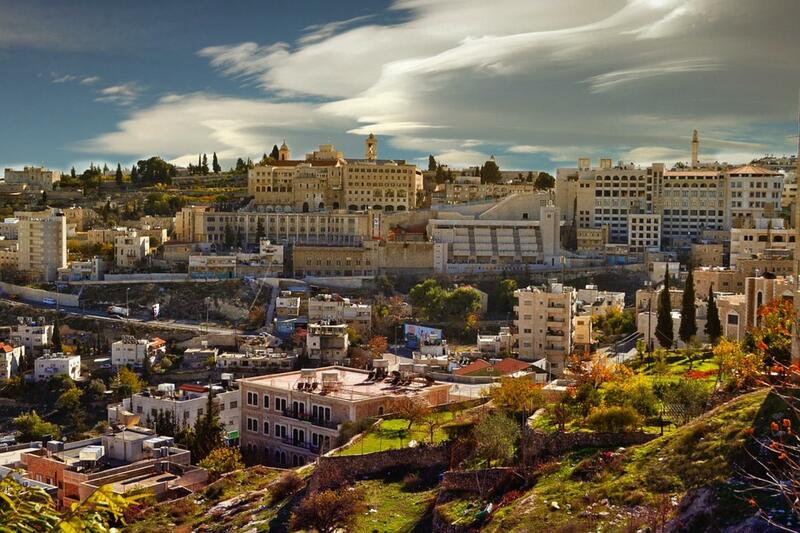 Jordan's capital a city, full of quirky neighborhoods, friendly people, and fabulous food. 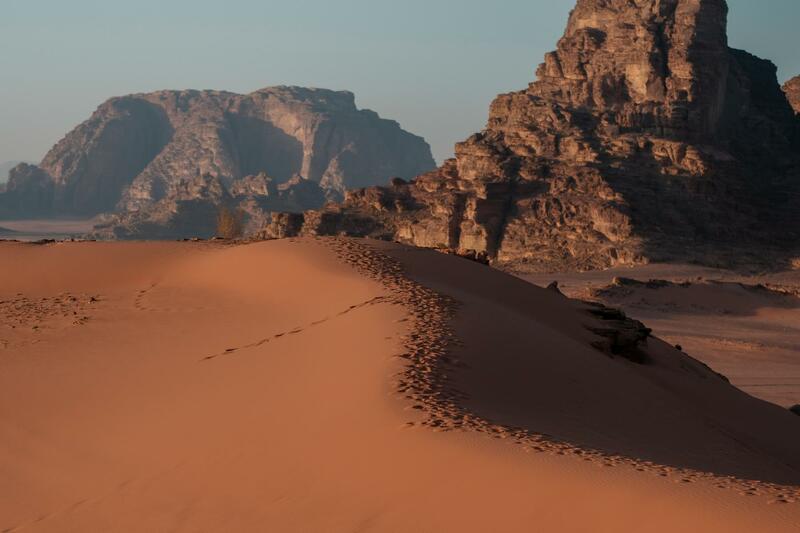 The next day we will hike 5km of the Dana Biosphere Reserve, Jordan's largest nature reserve. The trail brings you in through the irrigated gardens and orchards of Dana village to the visitor center, where you can enjoy lunch and take in the scenery. Dana village is a cluster of old stone houses built right on the edge of Wadi Dana, a spectacular valley that cuts down almost 1000 meters from Jordan's eastern plateau to the deserts at Feynan. The next day we will visit Petra. Petra an ancient city, it was once a great cosmopolitan marketplace and trading center. However, its commercial value diminished with the rise of the Eastern trade-route from Myos Hormos to Coptos on the Nile, what is left now is the ruins of the once-great vibrant center. Nabataeans, an Arab tribe who began as tent-dwelling Bedouin but soon came to dominate the most lucrative trade of the ancient world: incense. They used the money to create this city and to build an empire that extended from the Red Sea to Damascus. They also absorbed the architectural ideas from Egypt, from the Babylonians, and from the Greek cities of the Mediterranean, using them to create the hybrid culture that you see in these ruins. I think no matter how many times you've seen it reproduced on film, nothing beats our first glimpse of Petra. The classic entry to the city takes you through the long twilight of the siq, a narrow canyon that twists for more than a mile through the red sandstone, and then stuns you into silence with the sunlit façade of the Treasury, a monument cut into the rock some 2000 years ago with a refinement that is scarcely believable. 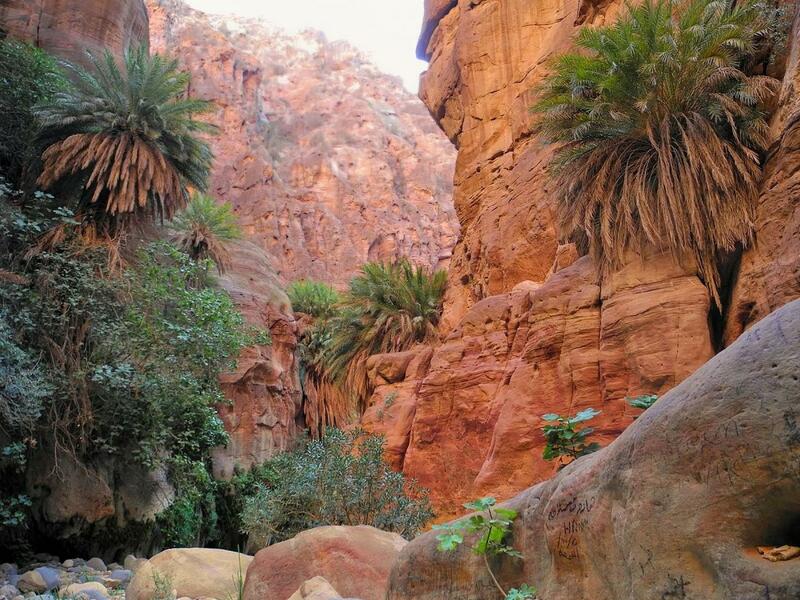 We will continue hiking Petra the next day for 8km. The hike brings you out above the High Place of Sacrifice, from where you can see down across the whole of Petra and west towards Jebel Harun, Petra's highest peak. 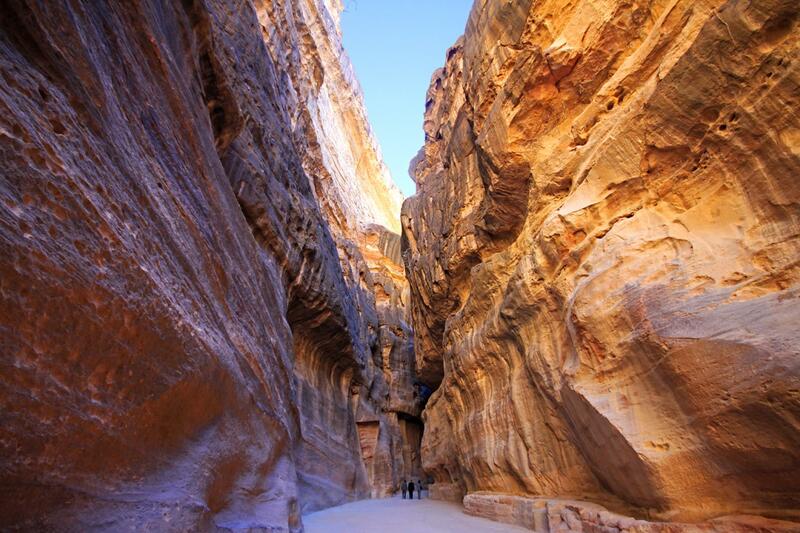 From here you descend through the Wadi Farasa, which has some of best temples in the city (including the Garden Tomb and the Roman Soldier's Tomb), emerging right in the heart of Petra. 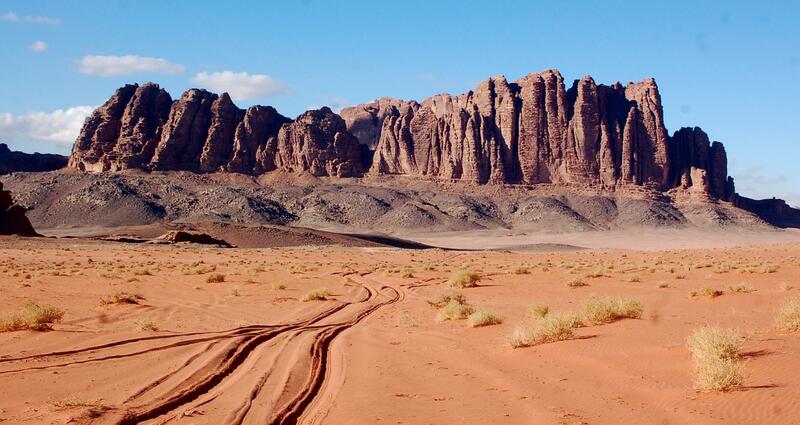 The next day let's explore Wadi Rum, the most beautiful desert landscape in the Middle East. 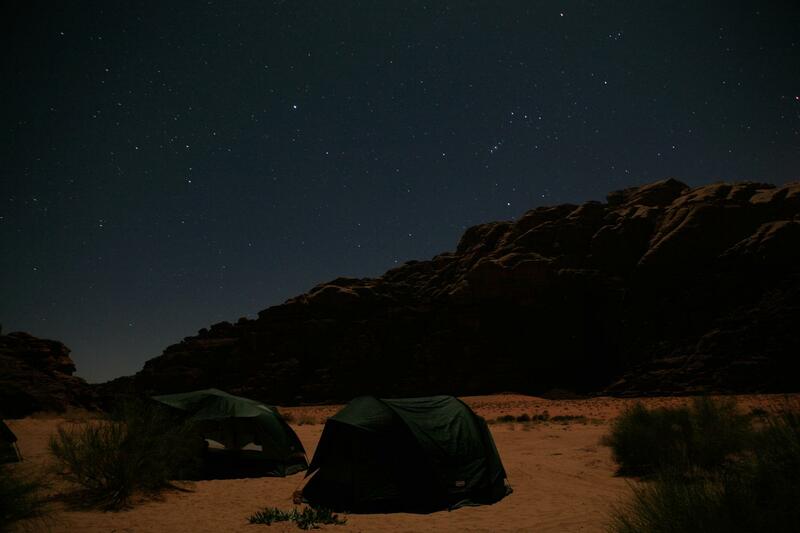 We will be camping and stargazing in our simple but comfortable Bedouin campsite. 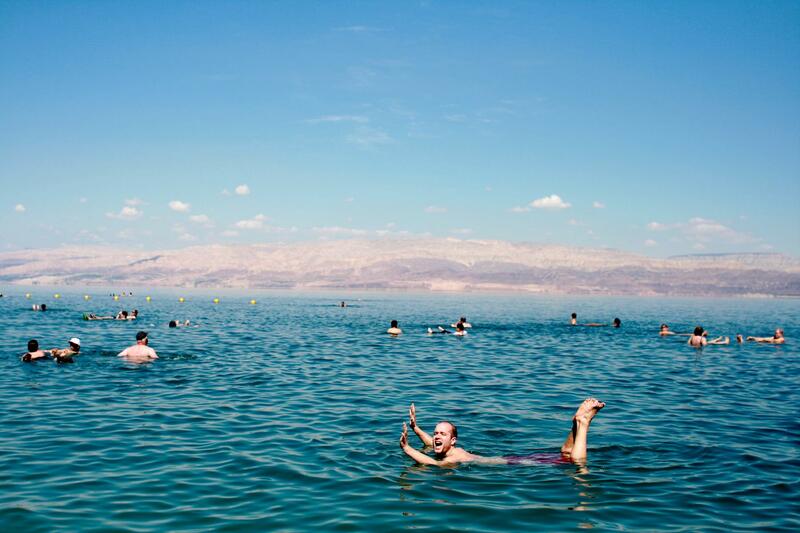 The next day we will head for Dead Sea and let's go for a float. This is the lowest point on the surface of the earth (some 400m below sea level) and contains mineral-rich muds that have been recognized since antiquity for their curative properties. This mud costs a fortune anywhere else, but in here we can rub ourselves all over to our hearts content! I can't wait for this treatment! I also loved reading history of Israel and I am fascinated by what I have read, I am very excited about the second half of the trip if I can see what I have read. Let's get on to Israel. 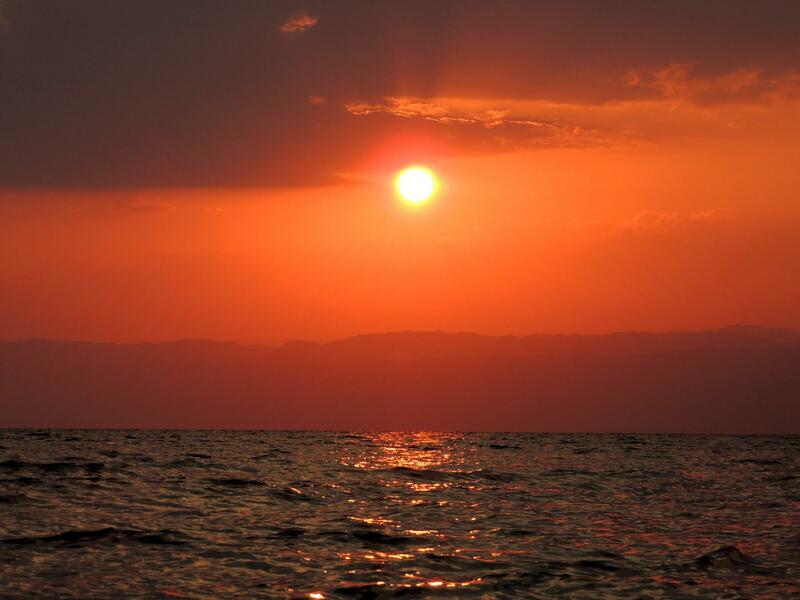 After our adventure in Jordan, we will head over to Holy Land, Israel. 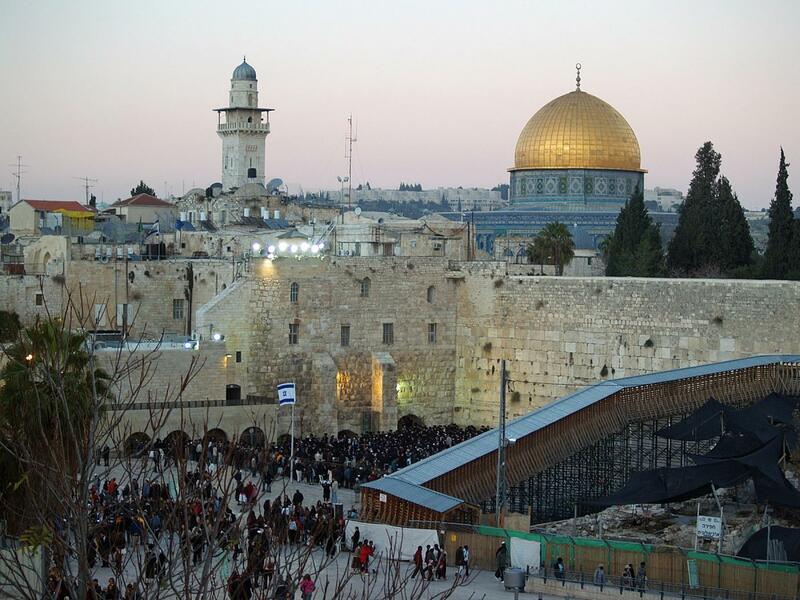 To help us appreciate Israel history, I have organized the trip into 4 historical periods of Israel, the first period First Temple period, Second Temple period, Late Roman, Byzantine and Islamic / Medieval periods and finally the Modern Jerusalem. We will move through the trip from the oldest period to the present time over the 4 days. We are engaging an Israeli archaeologist sharing with us the major events that shaped Israel that happened over 3000 years. I thought to help all of us understand and remember the stories that took place in Israel, we will organize a sit down interactive mini lecture with the archaeologist. 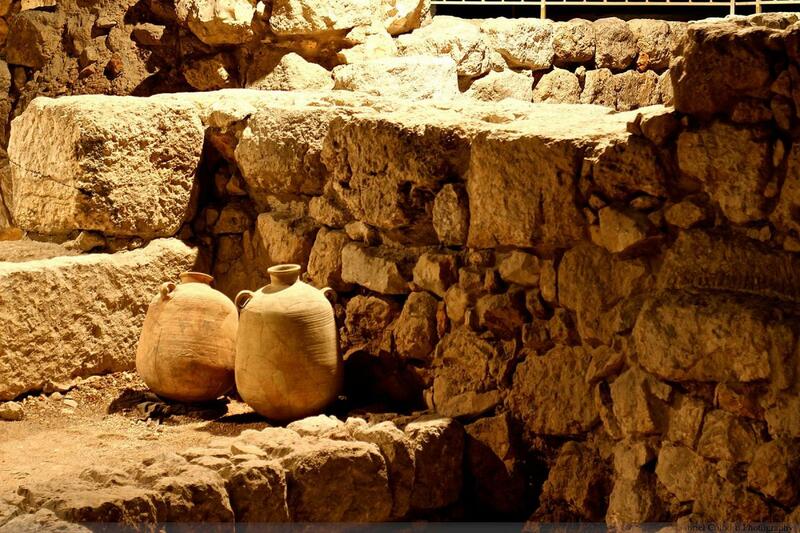 The first day will be visiting the First Temple period (called Ancient Israel and Judah period) places, Tower of David Museum, The Broad Wall in the Jewish Quarter, City of David, and possibly tombs in Begin Center where the Priestly Blessing was discovered. 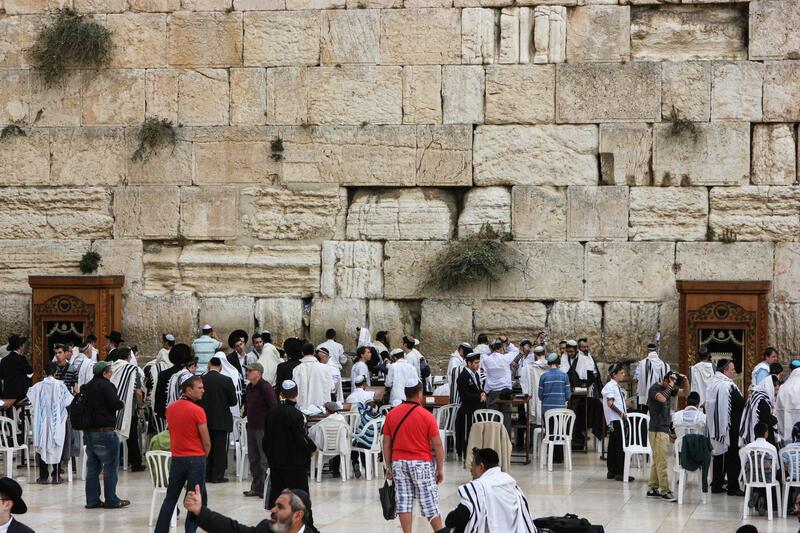 The second day, we will move on to the Second Temple period from 530 BC to 70 BC. We will be visiting the Israel Museum, The Herodian Quarter, Davidson center and excavations near the Temple Mount, The Western Wall, Tombs and Monuments in the Kidron Valley. On the fourth day, we will be talking about the modern Jerusalem, visiting Yad Vashem (Holocaust Museum), tour near the Parliament and the Supreme Court, 19th century neighborhoods: The Russian compound, The Neviim street. After which we will go over to the West Bank. I have delibrately left the West Bank to the last as some people may not feel that it is safe enough to go. I have checked that the political situation and there have been significant improvements over the years and it is safe for tourists to visit. For those that choose not to go, the trip will end here, however, for those that choose to stay on, let's go over to the West Bank, Hebron and Bethlehem. We will be visiting Bethlehem first. I thought this will be a very special day for us to see the birth place of Jesus, as we venture into the West Bank. 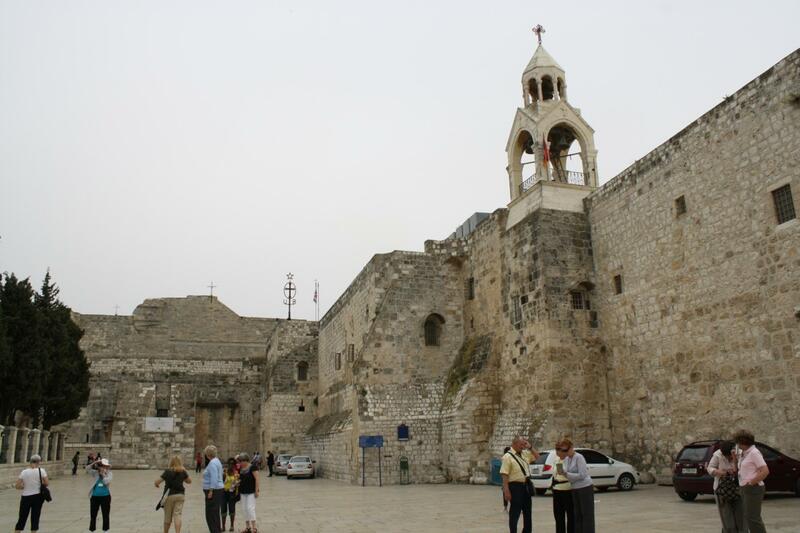 Our first stop is one of the oldest churches in the world, where it all began; The Church of the Nativity, the birthplace of Jesus. 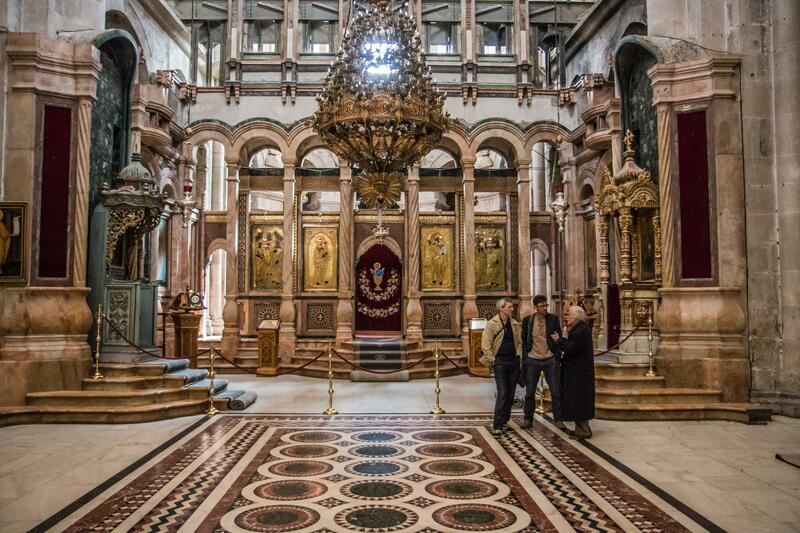 A huge church with a long history of religious significance, you will be able to see the various chapels of the Catholic, Armenian and Greek Orthodox Christians. The next day we will move on to visit Hebron City. Hebron, one of the four holy cities in Judaism and a sacred place in Islam. 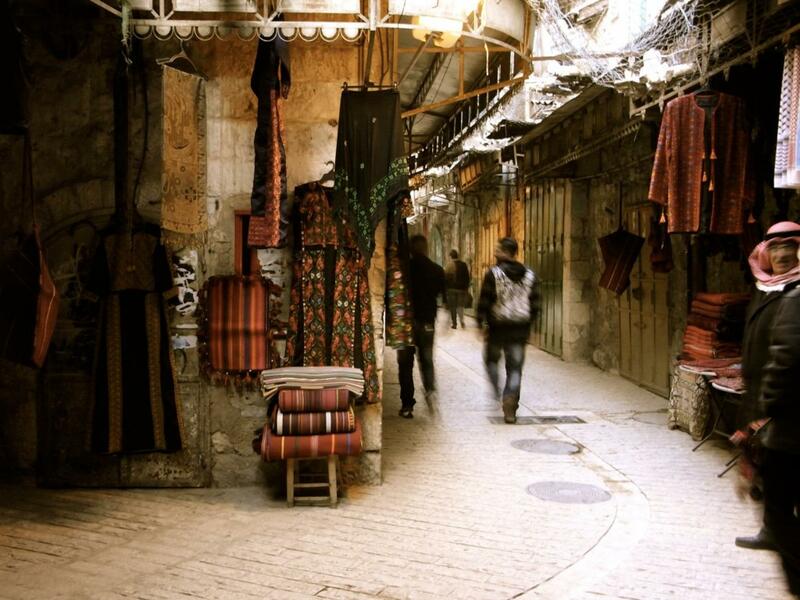 Our Hebron tour splits the day in two we’ll spend the morning with Jewish ‘settlers’ in the city, and the afternoon in the Palestinian part of the city. 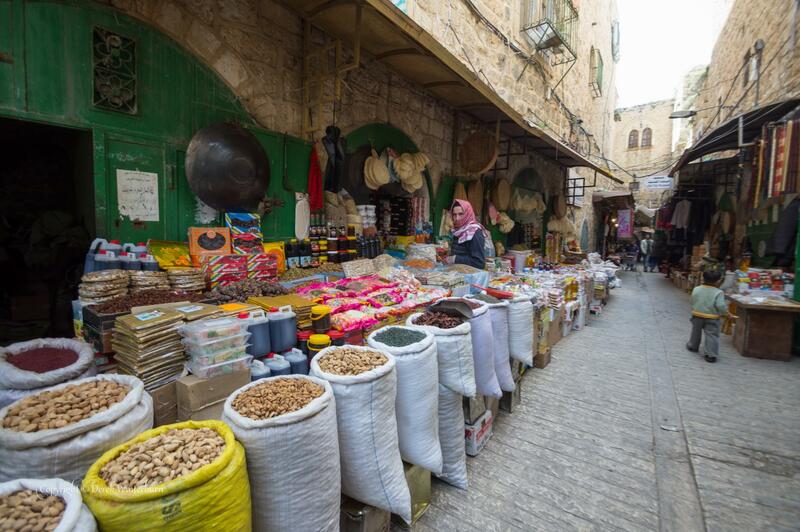 By hearing from both sides, this tour will give you a balanced insight into life in Hebron, the city of Abraham, and the site of the burial place of the Biblical Patriarchs and Matriarchs. We’ll visit the divided Tomb of the Patriarchs, home to the symbolic tombs of Abraham, Sarah, Isaac, Rebecca, Jacob and Leah – even Adam and Eve –, all said to be buried in the cave beneath, before touring the Jewish ‘settler’ neighborhoods of the city, visiting the Avraham Avinu Quarter and restored synagogue, the Beit Hadassah museum about Jewish life in Hebron before the riots of 1929, and the ‘Shavei Hevron Yeshiva’ in Beit Romano. We’ll also visit the hilltop Tel Rumeida, site of a Bronze Age archaeological site, army base, and the tomb of Ruth and Jesse from the Bible. Then crossing over into the Palestinian area, we’ll be met by a Palestinian guide and enter the bustling city center. Enjoying an optional home cooked lunch with a Palestinian family, you’ll have the chance to speak with a variety of locals. After lunch, we’ll climb on top of a family home for a rooftop view of the city, learn about the difficult conditions of Palestinian residents and shop owners living in close proximity to the nearby settlements, and visit the Muslim side of the Tomb of the Patriarchs, known as the Ibrahimi (Abraham’s) Mosque. We will end our trip after our visit to Hebron, flying out from Amman airport. 1) I understand some maybe skeptical about visiting West Bank and therefore the West Bank 2 days tours are optional. I wouldn't want to convince anyone to join me as I believe the media has done so much bad media reporting. I believe that if the local guides can bring us there, I would think is safe to go, as they are humans like us that wouldn't want to put their lives at risks too. When in Hebron, we will be taking a bullet-proof settler bus. 2) For those that maybe extending to Hebron, we will have to make our own way back to Jordan Airport at our own cost, which is about 5 hours journey.